In response to litigation filed in federal court in Manhattan by Sylvia Rivera Law Project, Legal Aid Society, and Willkie Farr & Gallagher LLP, the New York Department of Health amended a state regulation to provide Medicaid coverage for certain surgeries and procedures for transgender individuals that had previously been completely barred. New York State announced its plan to implement these important changes on December 17, 2014. Read more about what this means HERE. While our federal class action lawsuit continues to this day because many barriers to care still remain, this was an important day. Last winter, in support of this announcement, hundreds of you joined SRLP and others in our community in submitting comments, making suggestions, asking questions, and generally requesting more from the proposed changes to New York’s Medicaid regulations. In March we saw the result of this labor: the Department of Health incorporated some of our communities’ feedback into the regulation! Despite this success, thousands of vulnerable TGNCI (Trans, Gender non conforming, Intersex) New Yorkers still need access to affirming and holistic health care. Right now, the regulations still do not cover treatments that the state deems “cosmetic,” a tactic the state uses to continue to exclude critical procedures that are necessary for our communities’ survival. One SRLP member took a copy of the regulation to her provider but was still discriminated against and denied coverage. She, like so many in our community, is a powerful advocate working to hold providers, organizations, and allies accountable to implement the policies and practices of nondiscrimination so many of us have worked to assure. So where are we now with trans healthcare? While our lawsuit, Cruz v. Zucker, continues forward in the courts, and SRLP’s Direct Services Team continues to represent people denied coverage in fair hearings, through advocacy and know your rights education, our Movement Building Team is pulling together the pieces needed to ensure that our communities actually receive adequate healthcare and support. Over the last year members of our Movement Building Team have been working to identify next short and long term action steps – and support the legal efforts. We are excited to announce that we are expanding SRLP’s Trans Healthcare Now Campaign to explicitly name the ways housing and criminalization impact our overall health and wellness. We need your support as we create new public resources, hold institutions accountable, and assure that our TGNCI communities are uplifted in healthcare decision making and leadership. Movement work could not happen in New York State without the TGNCI community leaders who’ve continued to push their local and state governments to be accountable for respecting the dignity and worth of low-income, immigrant, POC, TGNCI communities. Crucial community health advocates like CK LIFE, the only trans people of color directed healthcare organization in NYC, whose work to directly train medical providers, communicate with insurance companies, and general advocacy for TGNCI community is unlike any organization. As a TGNCI person of color seeking holistic healthcare, I know that my overall health is impacted by the trauma I’ve dealt with, the policing I experience, the threats of violence placed on myself and those I love, a need for stable housing, employment, education, and the ability to access affirming financial, spiritual, mental, and physical health resources. Our healthcare needs include not only hormones and surgery but holistic primary care, mental health, public education, ending the epidemic, housing support, economic justice, and harm reduction services that are TGNCI affirming. SRLP is moving forward with our Trans Health Care Now campaign in order to see that new and old policies enacted to protect and support TGNCI New Yorkers are implemented and better yet that we create economic opportunities for TGNCI people in doing so. Check out SRLP.org for resources, ways to get involved, donate, and to share our work. Stay tuned for upcoming Campaign Meetings and ways to comment on the proposed rules in order to secure meaningful healthcare for all. 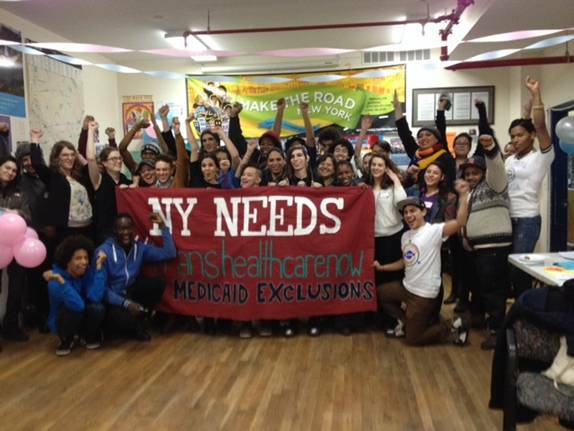 Photo from January 2015 event hosted by Audre Lorde Projects Trans Justice, GLOBE Make the Road, and the Sylvia Rivera Law Project celebrating the Dec. 14th news about the new Medicaid regulation and creating space to make comments.